Make an appointment to talk about OAB today. If you need help starting the conversation, download our Doctor Discussion Guide. Talk to a Physician by Phone, Chat, or Video. 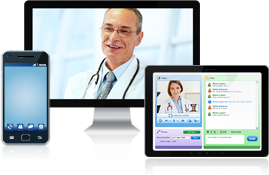 Start a virtual visit to talk to a doctor today. By clicking "GET STARTED NOW", you will be redirected to an independent provider of telehealth services not owned or operated by Pfizer. A fee, which may be reimbursable by your insurance provider, will apply for using this service. You are now leaving a Pfizer website to enter a website owned and operated by American Well where you can speak to a board-certified health care professional, via a phone call or an online video chat. Links to all outside sites are provided as a resource to our visitors and do not imply an endorsement or recommendation of a particular physician by Pfizer, nor an endorsement of any Pfizer product by an American Well provider or physician. Pfizer accepts no responsibility or liability for the content or services of other websites. All prescription decisions are at the sole discretion of the health care provider based on the patient’s needs.